【Authentically Wireless】: Now you can enjoy the Real Authentic Wireless headphones, which will set you free from the long cable and busy hands. Cable-free also means no more worries about the cord bouncing, tapping, or rubbing and no more cords stuck to your neck when you sweat. While jogging, running, cycling, hiking and gym workouts, there will be no tangle or physical friction produced by cord. 【Stereo Mode/Mono Mode 】: The headphones contains two pieces which can be used separately by you and someone you want to share it with, meaning you can share the same music/movie, or you can enjoy the stereo sound by using both earpieces. You can also use either one of them, and enjoy the music world with just one earpiece. 【Magnetic Charge and Higher Waterproof】:Unlike the traditional USB charge, it adopts the brand-new Magnetic Charge, which has better waterproof and sweatproof effect. 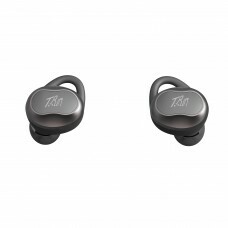 Besides, the 2 earpieces can stick to each other due to the magnetism, you won’t lose it easily when not in use. 【Secure Fit and Comfortable】: Ergonomic design and flexible TPE ear hooks naturally fit the contours of your ears, meanwhile interchangeable earbuds (S/M/L) fit different ear sizes to stay put and don't come loose. 【Advanced Bluetooth 4.1 and 2 Separate Battery】:Bluetooth 4.1 Technology lets you enjoy the High-Fidelity Super Clear Sound. Two separate batteries makes the usage time longer; you can enjoy 5 hours of talk and music playing time on each earpiece.